The ceasefire monitoring exercise on the Azerbaijan and Armenia state border, in the direction of Gazakh district, held in accordance with the mandate of Personal Representative of the OSCE Chairperson-in-Office on October 16, ended without incidents, the Ministry of Defense of Azerbaijan said in a message on Oct. 16. 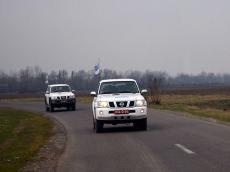 The field assistants of the personal representative of the OSCE Chairman-in-Office Gennady Petrika and Simon Tiller conducted the monitoring on the part of Azerbaijan. The field assistants of the personal representative Mikhail Olaru and Ognjen Jovic conducted the monitoring on the part of Armenia.